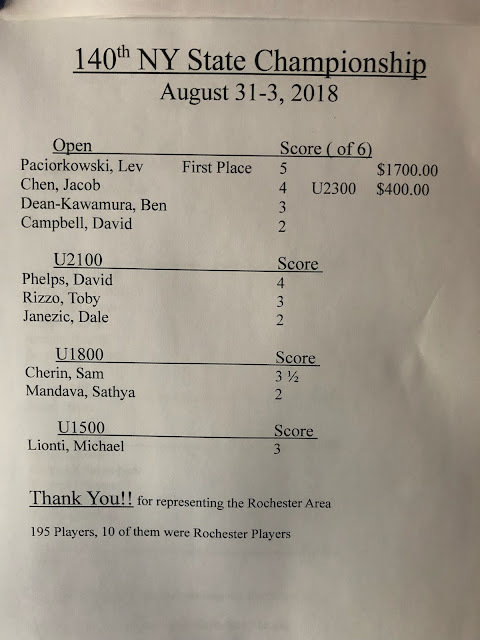 My Games from the 2018 New York State Championship! a long exchange-up endgame that I converted in 59 moves. Last weekend I played in the 140th annual New York State Chess Championship and won clear first place with 5.0/6 in what I would consider to be my best tournament performance to date. 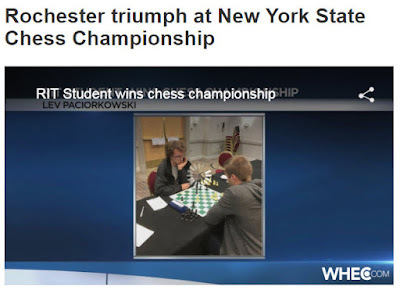 I am thrilled to represent Rochester as New York's newest State Champion! 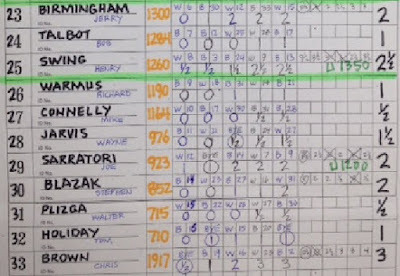 In the first round I was paired with an eleven year-old expert. I have a simple strategy when it comes to playing young, super-strong kids: avoid tactical complications and head for a quiet, calm position. What usually happens is that my opponent unnecessarily feels the need to take some drastic action and eventually overextends themselves, which ultimately leads to their demise. This game was slightly different - my opponent was really playing outstanding against me but unfortunately just missed a fine tactical detail in the middlegame. 1.Nf3 Nf6 2.c4 e6 3.g3 d5 4.Bg2 Be7 5.0-0 0-0 6.d4 (D) This is the mainline of the Catalan, a popular opening for white. By positioning his bishop on the long diagonal white puts a lot of pressure on black's queenside. 6. ... dxc4 Doesn't it seem strange for black to willingly open up that diagonal? Yet, it is by far the most common move! The point is to quickly play for c7-c5 to free black's position... 7.Qc2 a6 8.Qxc4 b5 9.Qc2 Bb7 10.Bg5 Nbd7 11.Nbd2 c5 (D) ...And black achieves this freeing break, so all his problems are solved, right? 1.e4 I thought for a little while on what to play, and eventually came up with 1. ... d5!? The Scandinavian!? I think this might be my first ever rated game playing this opening! It turns out that in recent weeks I actually had been briefly looking at the 3. ... Qd6 Scandinavian from the black side, so I had some knowledge of the opening. Also, this immediately throws any preparation my opponent might have done for me out of the window since I've never played this before in my life. 2.exd5 Qxd5 3.Nc3 Qd6 I had no intention of playing 3. 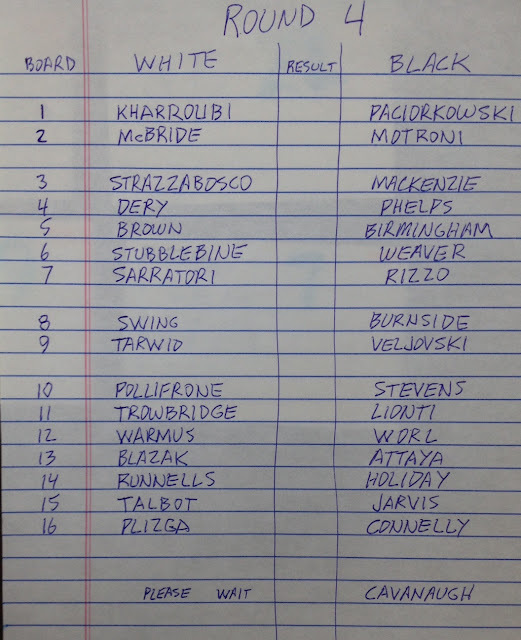 ... Qa5 - I think white's just better in those lines. 4.d4 Nf6 5.Nf3 c6 6.Bd3 Bg4 This is exactly the type of position I was aiming for - relatively quiet, no crazy early complications, and I'm just going to develop my pieces without any problems. 7.Ne4 This clears the c3 square for a pawn to solidify white's center. More common is 7.Be3 7. ... Nxe4 8.Bxe4 Nd7 9.c3 Nf6 10.Bd3 e6 (D) I have no desire to do anything crazy with 10. ... e5!? 19.Bxf6!? Continuing his dubious strategy of trading pieces to get a draw. The Nf6 was not a great piece, and it makes no sense to give up a whole entire bishop for it. The "weakening" of black's pawn structure is actually good since now the e5 square is taken away from white's knight. Still, the position remains equal! It is just much easier to play with black - I can begin accumulating small advantages bit by bit. 19. ... gxf6 20.Nd3 h5! Immediately targeting the kingside. I also love developing my rooks without moving them. 21.Kd2 Ke7 22.Rae1 Rh7 Preparing to double on the h-file and then play hxg4. 23.Reg1! Good defense. 23. ... Rg8 If 23. ... Rch8 then 24.g5! was white's plan. 24.Ke2 Rhg7 25.Kf2 Rc8 26.Rc1 Rh7 27.Rcg1 Rg7 28.Rc1 After a little cat-and-mouse play I finally come up with a new plan. 28. ... b5 (D) Intending a typical minority attack on the queenside with a5 and b4. The trend of playing strong young kids continues and in round three I was paired with a 14 year-old master. This move struck me as suspect since it weakens the long h1-a8 diagonal. Hence, I immediately try to take advantage of that fact. 9.e4! A central philosophy of strong players is that if you can meet a threat with a stronger threat, then do so! Black has no time to take on c4 since e4-e5 wins a piece. 9. ... dxe4 10.Nxe4 Nxe4 11.Qxe4 Bb7!? (D) Black should play 11. ... dxc4! 12.Qxc6 Nb6! when everything is held together. A serious mistake. If black just keeps shuffling around it's still difficult for white to crack through. Now the position opens up but black isn't ready for it. 24.Qe3?! I suppose I was just being a little careless but I didn't play the strongest continuation; 24.dxe5 Ne6 25.exf6!! (the move I overlooked) and white is completely winning. 24. ... Ne6 25.Bh3! This was my plan behind 24.Qe3 - by removing the knight and winning the e5 pawn I simplify the position favorably. 25. ... Bc8 25. ... exd4?? 26.Nxd4 and white has five attackers on the pinned Ne6! 26.Bxe6 Bxe6 27.dxe5 Bf5 28.Rd4 Rxc5 (D) To be honest I completely overlooked that black could just take on c5, but fortunately I have a tactic here which I immediately saw once we reached this position. This is a winning endgame for white - one pawn for the exchange is not enough with pawns on both sides of the board, and also I immediately can get my rook to an active position. The threat is 39.Rd6 c5 40.Rd5 winning a pawn. 38. ... Be6 39.Rd6! Bd5 40.Kf2 Kf7 41.Rd7+! White's winning task is more difficult without this move - the point is to restrict black's kingside. 41. ... Kf8 If 41. ... Kg6 42.Ke3 and black's king is frozen: 42. ... Kh6 (to try to play g5) 43.Rxd5! transposes into a winning K+P endgame. 42.Ke3 Be6 43.Ra7 a4 44.Kd4 h5 45.f4 g5 46.fxg5 fxg5 47.Ke5 1-0 After 48.Kf6 black loses his kingside pawns. My first adult opponent of the tournament! After the third round only GM Smith, IM Brodsky and myself had 3/3. Smith and Brodsky played a quick draw against each other this round and I had the black pieces against a strong master who had 2.5/3. My strategy this game was to get a low-risk position with black that I could press in. This should look familiar! I had the exact same position with the white pieces in the first round against Murgescu. In that game my opponent played the main line, 7. ... a6. I had looked up my opponent before the game and saw he played the Catalan so I prepared a rare move: 7. ... b6!? At first glance this move looks like it's asking for trouble - can't white just play Ne5? But actually the idea is to sacrifice the exchange! After some considerable thought my opponent played: 8.Qxc4! A good practical decision! He correctly suspected that this was some kind of preparation and decided not to follow me into my rabbit hole of computer analysis. The main move is 8.Ne5, after which black plays 8. ... Qxd4! 9.Bxa8 Qxe5 and for example after 10.Bf3 Nd5! 11.Qxc4 Ba6 12.Qa4 c5 (analysis diagram) black has full compensation for the material deficit since it is hard for white to develop the queenside. The position is still equal but I have managed to create some annoying pressure. Notice that 24.f4?? loses on the spot to Ne3++ and mate next move. White needs to choose a square for his rook and unfortunately chose the wrong one. 24.Rd1?! 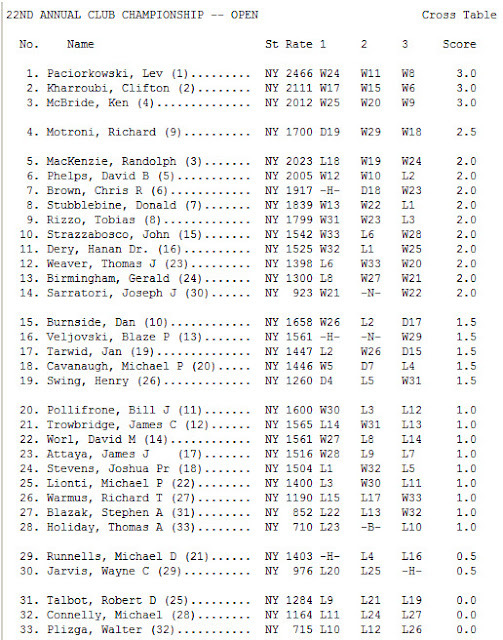 24.Rc2 would have maintained approximate equality. 24. ... Qc7! The only move that gives black an advantage. The knight is hanging and Qc2 is an annoying threat. 25.e4 (D) Under pressure white sacrifices a pawn. The alternative was 25.Nd3 Qc2 26.Re1 Ne3+ which is also good for black. 40. ... Ra5! Accurately preventing g4-g5 which would give white better drawing chances. 41.Rc6 Kg7? But unfortunately I failed to notice the point of white's last move. Instead after 41. ... g5! 42.hxg5 hxg5 black retains excellent winning chances. 42.g5! Oops! I realized my mistake immediately - now if I take twice on g5 I lose my a-pawn, and the resulting 3 vs 2 ending on the kingside should be drawn. I tried 42. ... hxg5 43.hxg5 Ra2+? The final mistake, which completely throws away all winning chances. The best try was 43. ... Rxg5 44.Rxa6 and then I could still keep pressing for a win, although white should be able to hold a draw. 44.Kg3 I realized that white is planning Kg3-f4-e5 and then f3-f4, but it is too late. The game is now a draw. 44. ... a5 45.Kf4 Ra3 46.Rc8 a4 47.Ra8 Kh7 48.Ra7 Kg8 49.Ra8+ Kg7 50.Ra7 Ra1 51.Ke5 a3 52.f4 a2 53.Ra8 Kh7 54.Ra7 Kg8 55.Ra8+ Kg7 56.Ra7 Kg8 1/2-1/2 There is no way for black to make progress. 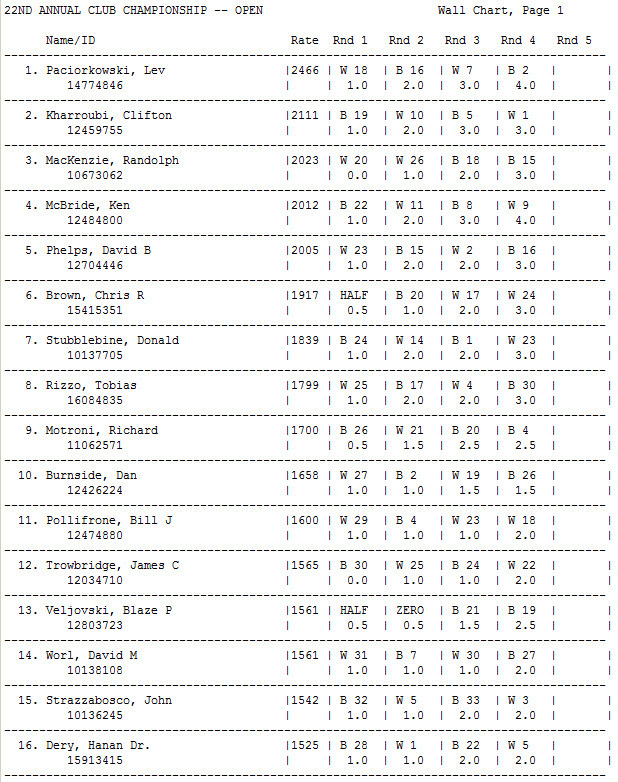 So, after the fourth round I was still tied for first with 3.5/4, but I was not at all thrilled with drawing that endgame. Oh well, these things happen. In the penultimate round I got white on board one against the #1 seed David Brodsky. He's impressively ranked #3 among American 15 year-olds. I had done some opening preparation against him was looking forward to an interesting game. 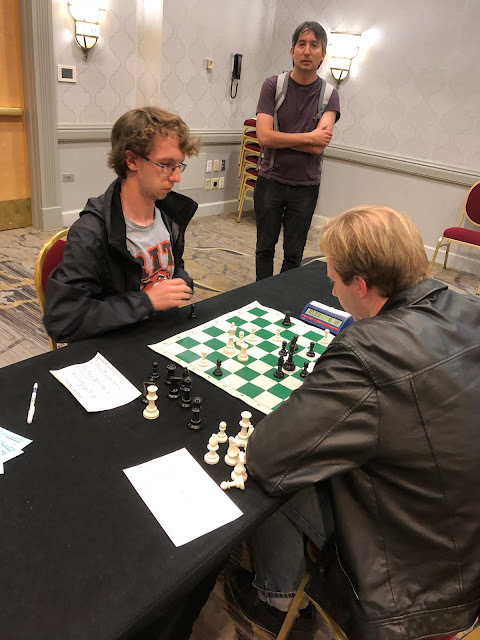 On board two, Bryan Smith had white against Jay Bonin, who was bouncing back in the tournament after a first round loss. As a draw against a 2500+ it was definitely not a bad result, but again I wasn't too thrilled about not converting a much better position. I would say that having a competitive attitude is important when trying to win tournaments - even one single draw can make the difference when trying to get first place so it is important not to get too complacent about drawing higher rated players. 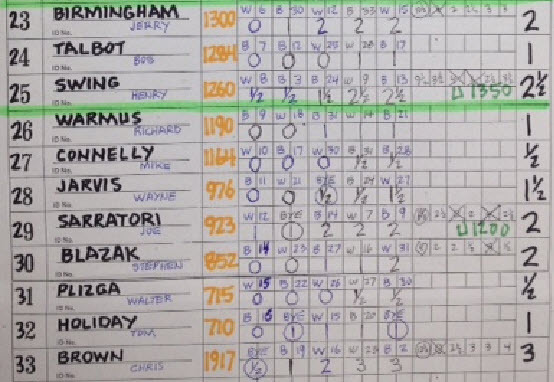 Luckily for me Bryan Smith only managed a draw against Jay Bonin this round, so it was still Smith, Brodsky and I all tied for first at 4/5 going into the final round. Sitting at 3.5/5 were Bonin (2414), Heiserman (my round 4 opponent) and a fair mix of other players that included NM Jacob Chen (2204). The final round. I'm on board one playing the grandmaster and right next to me on board two David Brodsky has black against Jay Bonin. 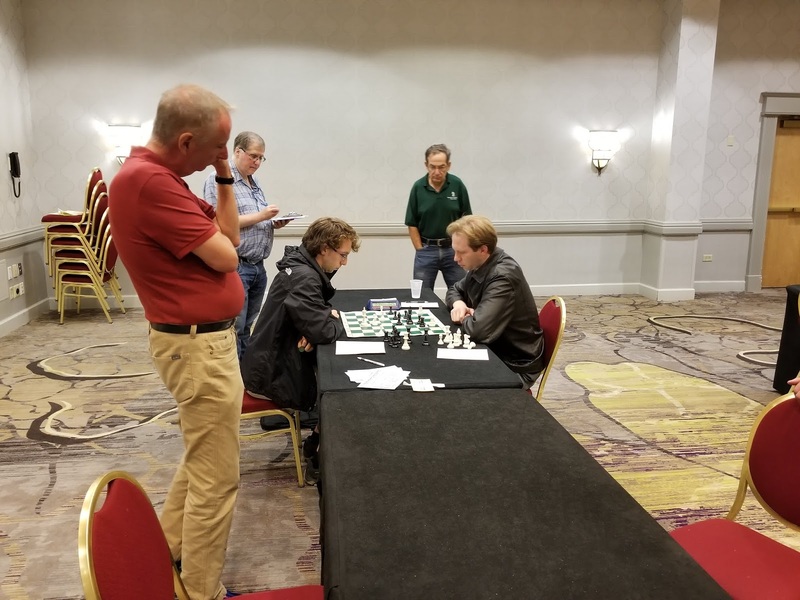 It was an interesting situation - I figured Brodsky would try to win with black and hope for me to draw my game with Smith, while at the same time Smith is trying to win with black against me and hoping for Bonin not to lose. Going into this round I knew any outcome was possible - either Smith, Brodsky or myself could end up walking away with the title or there could be a massive split for first place if we all drew. In these tense situations I find it's important to forget about the tournament standings and just play your best chess. 6. ... Bf5 Surprise! The bishop does not normally go here in a Botvinnik setup so my GM opponent is clearly up to something. I correctly judged that he wanted to play for Qd7, Bh3, and then h5-h4 for some kind of kingside attack (this is a typical way for black to play aggressively in this opening in blitz, but is somewhat crude in a slow game). 7.d3 Qd7 8.Re1 Perhaps unnecessary, but I decide to take some precautions against black's plan. Against ...Bh3 I can reply with Bh1, keeping my valuable light-squared bishop as a defender of my king. 8. ... Nf6 9.a3 I couldn't think of a productive developing move to make so decided to start my own plans on the queenside with a3, Rb1 and b2-b4. 9. ... Bh3 10.Bh1 h5 Threatening 11. ... h4 and if 12.Nxh4? then 12. ... Rxh4! is a common tactical theme. 11.Bg5 Covering h4. 11. ... Ng4! I settled into a long think (15 minutes), realizing I had underestimated how strong this move was. Black's plan now is a quick f6-g5-h4 followed by checkmate, winning the state championship, and an early drive back home. I can't stop black's moves, so I need to come up with some kind of fast counterplay of my own. I noticed black's self-trapped bishop on h3 and so continued: 12.Nd5 f6 13.Nf4!? (D) Reaching a very complex position. So I managed to win one pawn back and damage black's pawn structure on the queenside. This ending without a doubt should be winning for white (multiple open files on both sides of the board + up an exchange = very good), but that doesn't mean that it's easy. How exactly do we go about winning a won position like this? Here's the two magic words: counterplay and patience. First of all, you don't want your opponent to have any counterplay at all, not even a sliver. Black's only hope to draw this endgame is to somehow get his rook and bishop active enough to make serious threats against potential weaknesses in white's position. But if white just methodically restricts black's piece activity as much as possible, sooner or later something in black's position will crack and everything will fall apart. The patience part is important because you need to remember that white is not in a rush. When playing with a permanent advantage (extra material) you can go nice and slow - figure out the best squares for your pieces, maneuver around for a while before making any committal decisions. From the diagram above, I started by playing: 31.Rg6-g4 The h4 pawn is a problem child for black that requires constant babysitting. Now the Bf6 cannot move anywhere without undefending the pawn. 31. ... Kc7 I thought Smith might try for some play with 31. ... d5!? (usually it is a bad idea for the defense to make committal pawn pushes like this) in which case I had prepared 32.Rb3 keeping everything under control - notice how the Rg4 also defends c4. 32.Kf3 a5 33.a4! There's no need to allow black to play a4 himself as that fixes my a-pawn (a potential weakness since it's isolated) on a dark square where it may be vulnerable to Bb2 sometime in the future. 33. ... Rf8 34.Ke2 Rd8 Notice how passive black is. His rook has no way to get activity. 35.Rb3 Rf8 36.Rg1 This begins the second phase of conversion: once I have consolidated my forces and centralized my king, I need to invade black's camp and start attacking stuff. The a5 pawn in particular is a scrumptious target and I can access it by doubling along the b-file and invading. 36. ... Be5! The move I expected. Black immediately seizes the opportunity to post his bishop on g3 when he can support a rook invasion to f2. 37.Rgb1 Kd7 The immediate 37. ... Bg3? loses to 38.Rb7+ and 39.Rb8+ winning a rook. 38.Rb8! Continuing to play actively. Black cannot afford to trade rooks and so must lose some time. 38. ... Rf7 39.Rg8! This is where it's important to remember the patience part. White has all the time in the world to press in this position, so just take it slow and easy. Every single move I was spending maybe a good couple minutes just looking for black's potential counterplay and how I could prevent it. The hasty 39.Ra8? would allow 39. ... Rg7! when I will find it difficult to defend the h3 pawn. 39. ... Ke6 Against 39. ... Bg3 I was ready to play 40.Rf1! preventing Rf2+ 40.Rg6+ Bf6 41.Rb8! (D) Further restriction. Black's pieces are paralyzed. 41. ... Kd7 42.Ra8 Now we can begin targeting a5. 42. ... Ke6 43.Rgg8 43.Rxa5 is fine too, but I didn't want to allow a possible Rf7-f8-b8 just yet. By the way, another practical reason why it's good not to rush is that you force your opponent to make more moves that are difficult - every move black makes he needs to make sure he doesn't destroy his own position or blunder some tactic. That burns time off the clock and also wears people out. 43. ... Be5 44.Rgf8 Rg7 45.Rg8 Rf7 Repeating just to burn some time off black's clock. I should mention I still had a decent time advantage here too (maybe about 35 minutes vs my opponent's 15 or 20). 46.Rg2 Ending any possible Bg3-Rf2 ideas. 46. ... Bc3 47.Rg4 Bf6 47. ... Rh7 is not appealing. 48.Re4+ Kf5 49.Rf4+ Ke6 50.Rxa5 At last I finally take the pawn. However before doing so I calculated ahead to make sure I can meet black's coming rook activation effectively. 50. ... Rf8! Intending to seize the b-file next move which I cannot prevent. 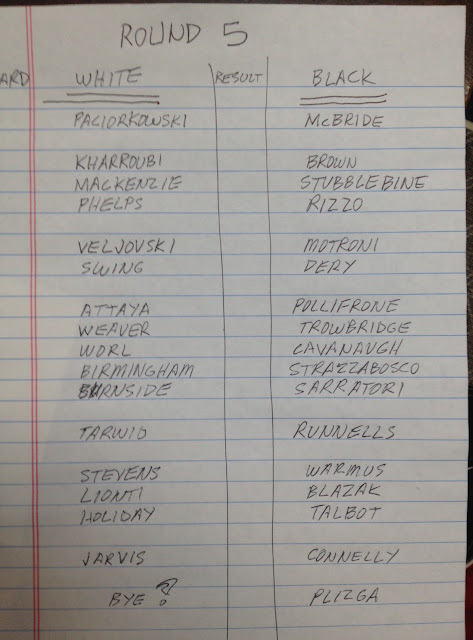 51.Ra6 With a specific idea in mind that will become apparent later. 51. ... Rb8 52.Kf3 Rb3 If 52. ... Rb2 53.Ke4 Rh2 I had prepared 54.Rf3 when everything is defended and d5+ is not playable because after cxd5 the recapture ...cxd5 is illegal thanks to the Ra6. From here white can continue to make more progress, perhaps with d3-d4 at some point. 53.Ke4 Ra3 54.a5 Ra4 (D) 54. ... Bc3 55.Rxh4 doesn't help black. My game vs Smith was one of the last ones to finish. 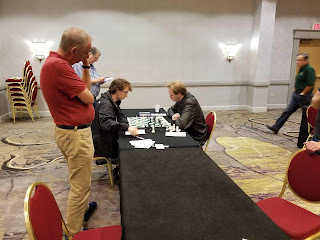 On board two Jay Bonin had already managed to win against David Brodsky in an intense time scramble leading up to move 40, leaving me as the only player with 5/6! Jay Bonin and Jimmy Heiserman tied for 2nd-3rd with 4.5/6. 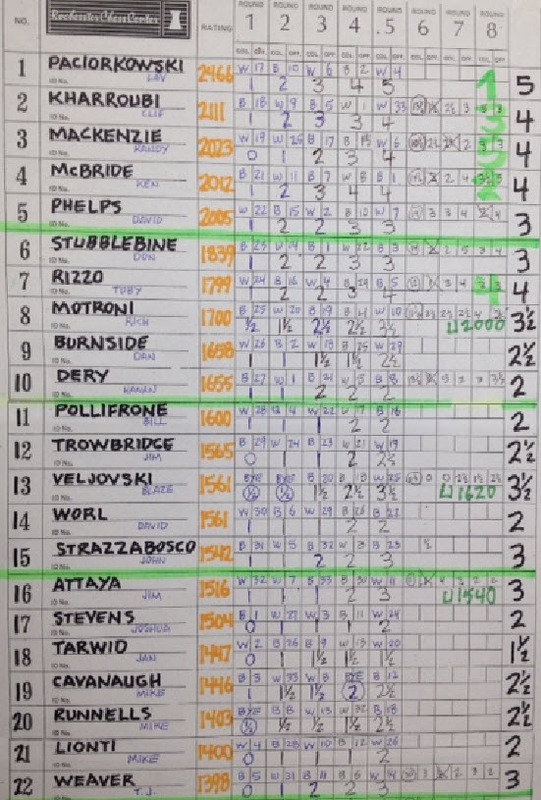 David Brodsky and Bryan Smith were part of a four-way tie for 4th place at 4/6. 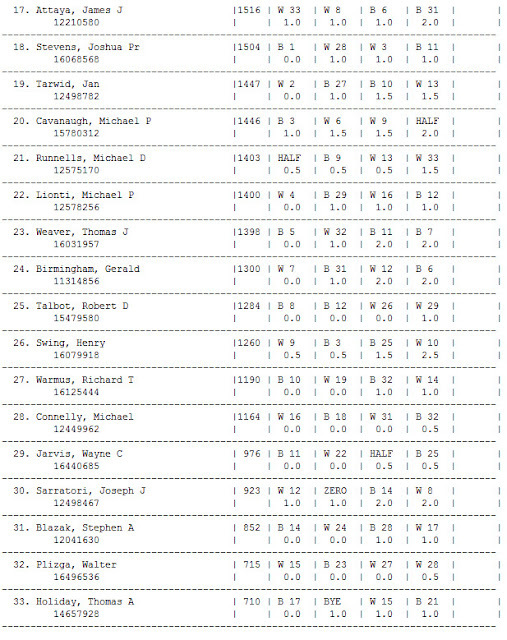 NM Jacob Chen (2204), also at 4/6, was part of a three-way split for the U2300 prize. You may have noticed that I happened to get four whites this tournament - that was not a mistake! I got lucky with the way the pairings worked out - having white in the last two rounds against the top two seeds was definitely a nice advantage to have. Believe it or not (I didn't believe it during the game) after 47.Rxh3 Rxh3 48.Nxh3 Kd5 white can indeed hold a draw! For example: 49.Nf2 f6 50.Kc2 e4 51.Kb2 Ke5 52.Nh3! (only move; I missed this when I was evaluating this position in my calculations during the game) 52. ... f4 53.Kc2 f5 54.Kd2 and white holds. Objectively speaking, it was a mistake for me to trade rooks on d3 earlier but instead of 47.Rxh3 my opponent played 47.f4? and after 47. ... f6 48.Nxh3 Rh4 Avoiding 48. ... Kd5?? 49.fxe5! when 49. ... fxe5? loses to 50.Nf4+! 49.Rh1 Kd5 50.Ke2 e4 51.Kf2 Rh8 white resigned (0-1). The other way to win a pawn is the way I played: 25. ... Ne3+ 26.Bxe3 Bxe3 27.Qb3 Forced, otherwise Qc2+ 27. ... Qxe5 28.Qxe3 Qxb2+ and black won a pawn. The strongest move, which I played, is 24.Rf1! and due to the unstoppable threat of Rxb7 black is forced to trade queens with 24. 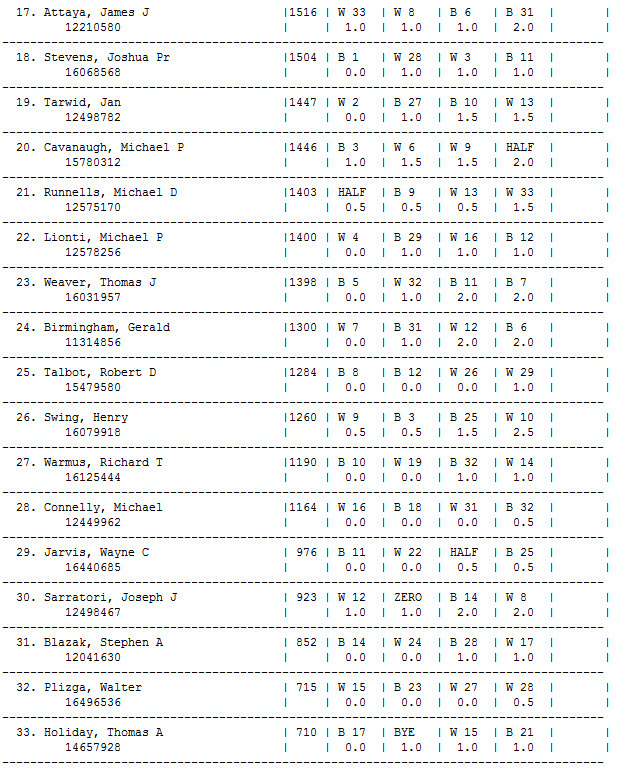 ... Qg3 25.Qxg3 Bxg3 26.Bxc6 bxc6 27.Rf7 and after 27. ... Bh4 28.Rg7 I win the g6-pawn. 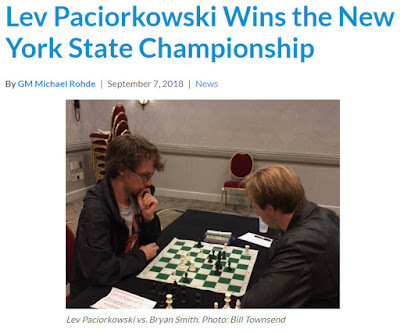 Lev Paciorkowski wins 1st Place at 140th Annual New York State Championship! 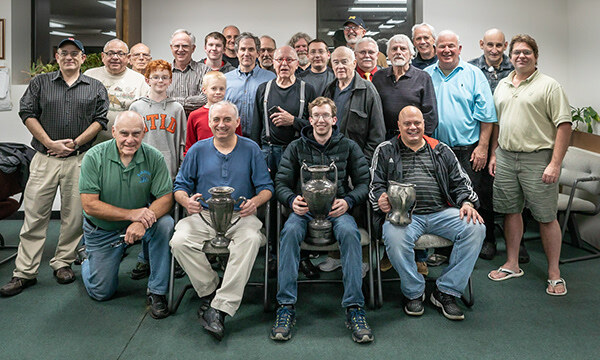 The chess club celebrated Lev's triumph at the NYS Championship with a party Wednesday night at the Rochester Chess Center. 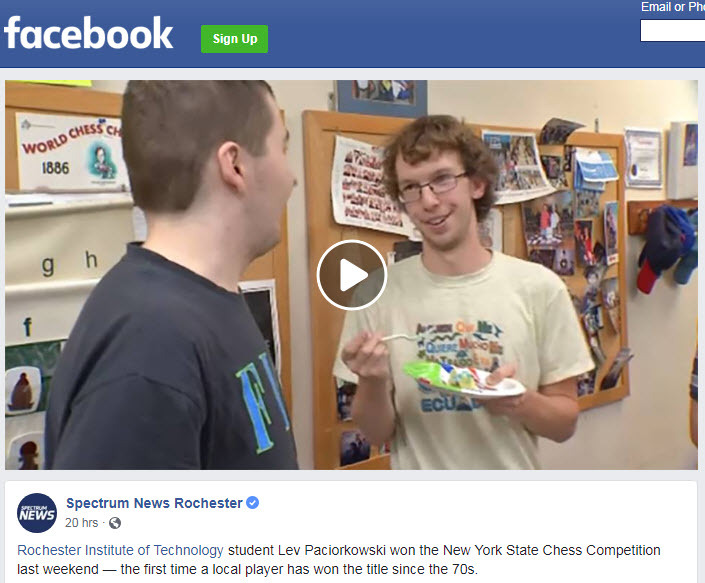 Spectrum TV News came to interview Lev while he was at the chess center and took video & pictures during the CCCR chess games. Senior Master Lev Paciorkowski (left) won his game against GrandMaster Bryan Smith in the 6th and final round of the New York State Championship. Sept 2, 2018. Click above for Video from WHEC TV News covering Lev's triumph! Senior Master Lev Paciorkowski (left) and GrandMaster Bryan Smith.Sept 2, 2018. Same Cherin and Ben Dean-Kawamura. Sept 2, 2018. 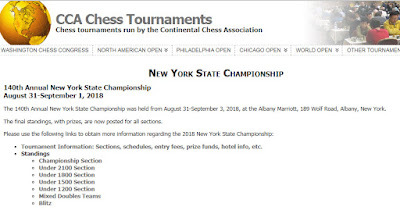 This year's 140th Annual New York State Championship was held during Labor Day weekend at the Marriott in Albany NY, Aug. 31 - Sept. 3, 2018.
this event. For more information on norms, see The USCF Title System. Dan Pike scored 5 out of 6 in the U1500 section and took 2nd place and $650. A game of Dan's will be posted in this post soon. Dan is a former CCCR member. begins Sept. 17th! Register by 6:30pm on 9/17. The flyer is below. 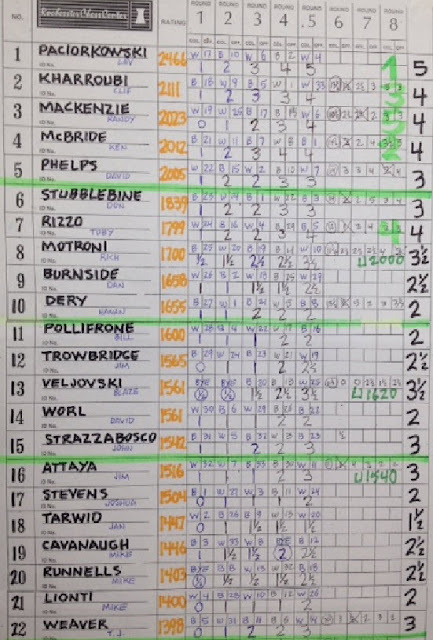 Senior Master Lev Paciorkowski is the defending club champion.